Create a custom notebook with pages that can be removed, organized, shared, and reattached. A magnetic spine and pages printed with a strip of iron ink keep things firmly in place—and also make all this movability possible. Pages can be scanned, photo copied, and printed, too. The magnetized spine can also hold onto your pen. Dimensions: 5.5" x 0.63" x 8.125"
I like the idea of being able to move the pages around. It makes list keeping and note taking much easier. I haven’t used this yet but love the idea and know I’m going to use and enjoy it! Great idea! Charles Good-Man wanted to make a custom notebook with pages that could be moved and organized just as he liked. The artist and graphic designer was frustrated with the limits of a typical sketchpad and after experimenting for over two years, he finally landed on a magnetic solution. Rekonect is the result of Charles re-engineering the standard notebook and making it anything but. A strip of iron ink printed on each page makes it connect to the notebook’s magnetic spine. This holds the pages firmly in place and makes them easy to remove, organize, and reattach exactly how you want them. 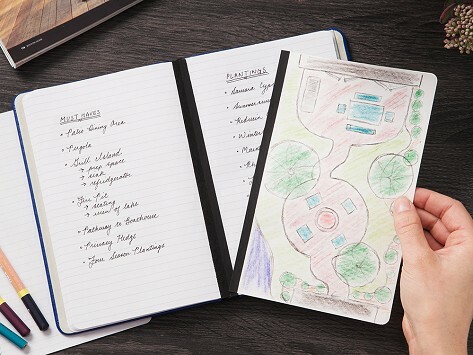 Write, draw, scan, photocopy, or print on one, and then put it back in any spot in the notebook. Now things like daily lists, sketches, and notes are as moveable and shareable as your thoughts.